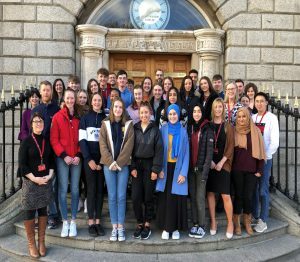 Twenty three lucky transition year students out of over a hundred applicants from Dublin and the midlands took part in the 4th annual Mini- Science TY programme here at RCSI. 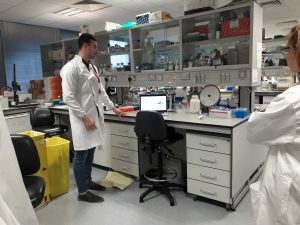 This was a three day interactive science programme, led and co-ordinated by Dr Helena Bonner and Professor Jochen Prehn in the Department of Physiology and Medical Physics at RCSI in conjunction with the the Centre for Systems Medicine, based at RCSI. During the three day programme which finished on Wednesday 6th of February, students had the opportunity to experience life as a scientist. 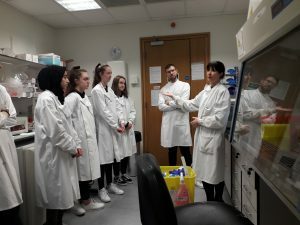 The programme started with a tour of the RCSI St. Stephens Green campus which also provided them with an opportunity to learn about the different courses offered in RCSI. 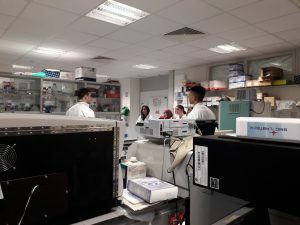 Students had the opportunity to find out about research being done in both the Centre for Systems Medicine and the FutureNeuro centre. 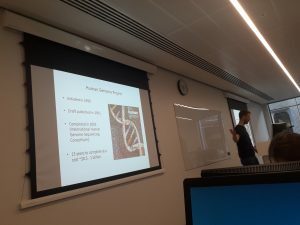 This included talks on the aging of the human brain, epilepsy, brain tumours, motor neuron disease, and cancer. 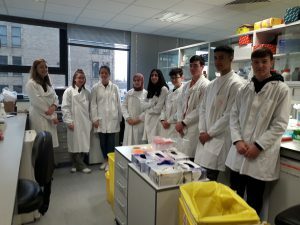 They enjoyed visualising cancer and neuronal cells using fluorescence microscopy. They extracted their own DNA. They now understand the impact that science/research can have in society whilst learning about the ‘Waterspout’ project as well as the importance of collaboration and communication skills in scientific research. They thoroughly enjoyed acomputer based practical and a presentation on career options with a STEM qualification. Speaking on the programme, Professor Jochen Prehn, Director of the Centre for Systems Medicine, RCSI said, “I am delighted to welcome the students to RCSI for this programme. I hope from the experience of the past three days that that the students learned a lot and will perhaps consider career in science”. Thanks to all the researchers in the department of Physiology and Medical Physics for volunteering their time to this programme and making it possible. Ms Luise Halang, Ms Aasia Batool, Mr KelvinEHowLau, Dr Amaya Sanz Rodriguez, Ms Mona Heiland, Dr Marion Hogg, Dr Triona Ni Chonghaile, Mr Kieron White, Ms Bridget Doyle, Dr Shona Pfeiffer, Dr Janosch Heller, Dr Brona Murphy Dr Isabela Aparicio, Dr Cristina Ruedell Reschke, Prof. Kevin Mc Guigan, Dr Gary Brennan, Dr Niamh Connolly, Dr Manuela Salvucci, Dr Simon Furney, and Mr Frank Donegan.